Mark Wahlberg And Gender Pay Gap: Is Donating $2 Million to #TimesUp Really the Solution? On behalf of admin of JML Law, A Professional Law Corporation posted in Discrimination on Wednesday, Jan 17 2018. Dealing with gender pay gap would make a lot of sense at the time when Hollywood is being bombarded with sexual harassment allegations accusing some of its greatest male stars of sexual misconduct and inappropriate behavior. Hot on the heels of outrageous reports claiming that Mark Wahlberg received a staggering fee of $1.5 million for All the Money in the World reshoots, compared to his co-star Michelle Williams’s per diem fee of $80 for 10 days of work, the actor announced a big move: donating $2 million to a #MeToo fund. In a move that many critics interpreted as Wahlberg’s desperate attempt to divert the public’s attention from his mammoth salaries that stand in stark contrast to the salaries of his female counterparts, the 46-year-old actor and his talent agency donated $1.5 million and $500,000, respectively, to the fund dedicated to fighting gender pay gap and sexual harassment in Hollywood. It’s been over 10 days since Wahlberg announced his generous donation, and it seems that the actor is actually off the hook. The most bizarre part is that both Wahlberg and Williams are represented by the same talent agency, William Morris Endeavor. Fact: the media later found out that Wahlberg’s regular All The Money salary was nearly 10 times more than Williams’. But Wahlberg is just the tip of the iceberg, our Los Angeles gender discrimination attorney at JML Law says. Gender wage gap is one of the most serious issues of gender discrimination in workplaces in California and all across the U.S.
And despite the fact that the media, politicians, Hollywood stars and other prominent figures have been calling for a change to solve the men-women wage gap for the past 10 years, the gender pay gap has remained relatively static over the past decade. Fact: Statistics shows that women working full time in the U.S. earn 80% of what their male counterparts are paid. Our best gender discrimination attorneys in Los Angeles point out that not much has changed over the past decade, and women are still largely underpaid compared to males working in the same positions/occupations. Moreover, women in Los Angeles and all across California have been filing gender discrimination complaints against their employers alleging gender wage violations in the past few months amid the #MeToo and #TimesUp movements. Women who seek legal help from gender discrimination lawyers have been able to achieve more success in getting their complaints and lawsuits heard in courts, and obtaining compensation for being victims of gender discrimination compared to those who aren’t represented by attorneys. 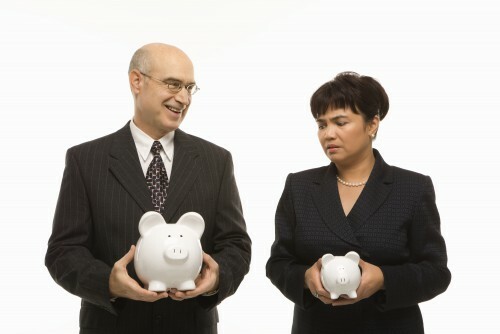 Researchers say that gender wage gap tends to widen as women age. Women under 35 are earning about 90% of what their male counterparts are paid. But gender pay gap widens for women over 35, who are paid less than 80% than their male counterparts. As gender wage gap has once again thrust itself into the nation spotlight, the chance of winning a lawsuit against your employer for paying you less than your male colleagues employed in the same positions/occupations is as high as never before. That’s why it’s vital to speak to a Los Angeles discrimination attorney to start legal action against your employer for violating California laws. Denying women equal rights and equal payment is illegal, which is why you shouldn’t think twice and contact one of our skilled lawyers at JML Law to defend your rights and seek justice. Call our Los Angeles offices at 818-610-8800 or send an email for a free case evaluation.